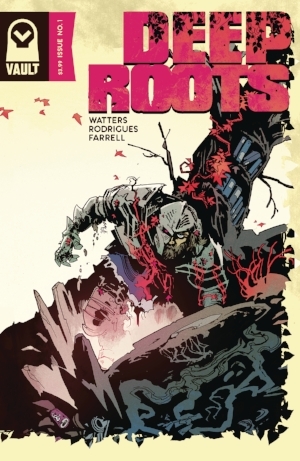 Deep Roots #1, available April 25, is one of the best books yet from rising publisher Vault Comics. I think I just got deja vu. It’s early in the week, I’m looking at new books for Wednesday, and a Vault Comics title seems poised to be a major hit, one that will grab a sizable and smart audience. It’s the same feeling I had last week before Wasted Space #1 dropped, and that book went on to garner significant praise from comic critics. As it turns out, though, I did not in fact just get deja vu. Vault actually does have another killer series loaded and ready for release. 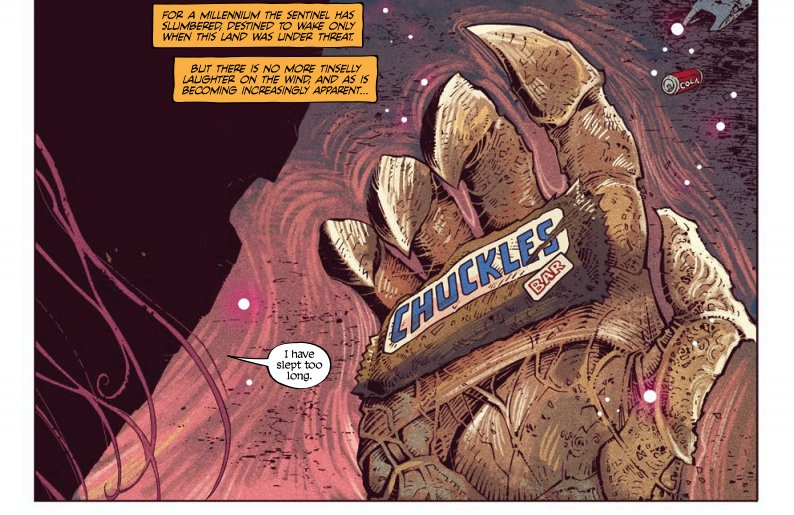 This time it’s Deep Roots #1, a book that, like Wasted Space, takes several huge ideas—here it’s eco terrorism, mankind’s abuse of the environment, capitalism, plus a little PTSD—and pairs it with a perfect aesthetic. And it’s that pairing of plotting and perfect aesthetic that most impressed me when I read Deep Roots. The art team is Val Rodrigues and colorist Triona Farrell, who work together to create a pair of distinctive aesthetics. To put it reductively Deep Roots is a genre-bending book with a dual storyline: one about a mythic realm of destiny and vegetation, another about a modern world in which said vegetation seems to be rising against humans that have paved and diminished it. For the real world, Rodrigues and Farrell work is realistic, using a detailed style evocative of Frank Quitely, Jon Davis-Hunt, or Geoff Darrow. For the mythic, they create lush, abstract landscapes closer to Christian Ward or Mike del Mundo. The script passes through these two worlds often (and rightly) without giving readers the direct connection, trusting (rightly again) the artists to convey it. Basically, I was impressed throughout at how Deep Roots handled this, making the dual plot threads easy to differentiate yet never so disparate that transitions began to feel like non sequiturs. So, yeah, the art is great, but what about the aforementioned script by Dan Watters? Well, his narration does an equally effective job of transversing the realms of our story, using a mythic dialect for the abstract bits but spare and direct sentences to ground us when we return to the real world. A panel from Deep Roots #1 where the real world seeps into the mythical realm of the story. Watters plotting—particularly the way in which it confidently handles the fate of its characters—is also bold, although to say much more would likely be a spoiler, or at least spoiler adjacent. I don’t want to go there. Just trust me when I tell you it works. Last week, we told you Wasted Space #1 would be a hit, and it was, drawing an impressive buzz for an indie that dropped on the same day as the landmark Action Comics #1000. Wasted Space was a great book filled with killer frenetic dystopian panels and underlaid searingly-relevant ideas. Combine it with a rising publisher like Vault, and it became a hit. We foresee the same happening with Deep Roots.